Momma4Life: Announcement - Slugterra: Returns of the Elementals on DVD 9/16 from Shout Factory Kids! 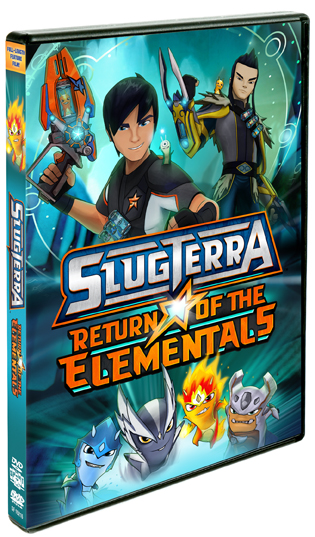 Announcement - Slugterra: Returns of the Elementals on DVD 9/16 from Shout Factory Kids! Get Ready to Slug It Out! Continuing the story from the hit TV series currently airing worldwide on Disney XD, Return of the Elementals welcomes a new member to the Shane Gang: Junjie, a master of the mysterious art of Slug Fu. But even with the power of five slugslingers working together, the Shane Gang find themselves in over their heads as they race to protect the ancient Elemental Slugs, the ancestors of all slugs found in Slugterra today. In the wrong hands, they could bring Slugterra to the brink of destruction. So when an evil alliance starts hunting down the Elementals, Eli and his friends take off in pursuit of the greatest threat their world has ever faced. About Nerd Corps Entertainment Inc. Nerd Corps Entertainment is a privately held IP creation, development, production, and distribution company based in Vancouver, Canada, with offices in Toronto, Canada. The company’s mandate is to produce stylistically innovative animated projects for television, online, and mobile based on a solid foundation of creative and exceptional storytelling. Working in a state-of-the-art studio with highly skilled artists and production staff, Nerd Corps’ expertise in creative development and execution covers all aspects of property generation and management, from development and production to distribution, marketing, interactive and licensing. The studio’s award-winning stable of productions includes original series Kate and Mim-Mim, Endangered Species, Slugterra, Storm Hawks, League of Super Evil and Rated A for Awesome, as well as Dragon Booster for Alliance Atlantis and Hot Wheels: Battle Force 5, Max Steel and Monster High for Mattel, Inc. Visit www.nerdcorps.com.